Since our two year long 4e campaign just ended, we are cleansing our gaming pallets over the holiday season by playing some other games. This week we played the Red Box Starter Set. Like last week’s game, we played the included introductory adventure, called “Twisting Halls.” Using Encounters Pre-generated characters from the 3rd and 4th+ Essentials seasons of D&D Encounters, the players used 4e analogs of the same characters from the Pathfinder Box the week before. Therefore we ended up with the clerics Sola and Hagen (Dasz); the warriors Quinn and Edith (The first ‘l’ in a dwarven syllable is always silent); the wizards Jarren and Barrian; and finally the elf roguess Keira Knightly. Aside: One of the greatest treasures of my “Encounter Days” as a dm are the wonderful pre-generated character cards I have collected. Glossy, colorful, sturdy, and concise, these characters offer everything a new player needs to jump right into the game. They are easy to read, and with a few exceptions, they offer all the pertinent information a player might require during a gaming session. The last three seasons have used the same six pre-gens, so I am glad to have gotten the variety of the first four seasons, including Dark Sun. The Adventure “Twisting Halls” is represented by a high quality poster map of a very packed and cluttered dungeon. Like introductory adventures from the dawn of time, it is full of classic monsters, traps, treasures and puzzles. The premise of the adventure is to return a box stolen from a caravan during a goblin raid. That raid took place in the “Read This First!” choose-your-own-adventure from the box, and so in our case it was backstory. The goblins were led by a robed figure on a black horse, and the adventurers followed their trail back to a mound, with two cellar-like stone stairways ending at doors. Right or left? The party of adventurers stumbled down the steps and the thief checked out the stone double doors, before they were blasted open by Quinn. Two goblins screech “Intruder alert!” and launch attacks. A guard drake soon joins from an accompanying room, and then a goblin hex-curser starts shooting blinding bolts from cover behind an urn. A dark horse whickers in a corner by a pool of water. After being blinded, QUinn wandered over to the shying horse, and notices that even though spider webs and dust surround the pool, it is strangely clear. The fght is quickly over, and after a cursory examination, the party heads north. 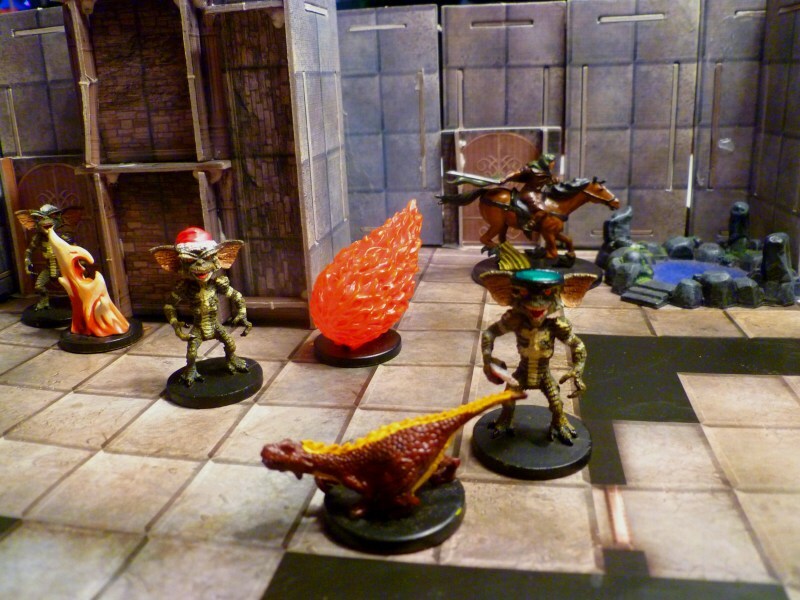 Pushing through the doors, the fighter Quinn is confronted by a spear clutching kobold. It eyes the knight with fear and suspicion, but when Quinn doesnt instantly attack, the kobold beckons him forward, down the hall, past more kobolds and through a red velvet curtain. The rest of the party follows at a discreet distance. Quinn feels the chill in the air and a white dragon asks why do they dare trespass? After role playing a discussion, and a skill challenge, the dragon admitted he hated the wizard Maraleth and agreed to let a few of them pass if they agreed to defeat the dragon’s nemesis. The two wizards and the rogue, however, were forced to pay 19 gold apiece to enrichen the dragon’s hoard. The encounter could have played out differently, as a very difficult combat, but the players chose to pursue alternative means, which was fun, and hilariously the same thing, only opposite happened last week: they role played the goblins and fought the dragon. It may have been the rogue, who was swallowed whole last week, who prompted her fellows to follow a less violent approach. It worked, and they passed through the dragon’s lair to be confronted by a squad of goblin archers and their pet dire rats. The three who payed were first through the door, and they had to endure a surprise round alone. One mage was knocked unconscious by a charging dire rat, and the other mage somehow managed to remain standing with no less than six feathered shafts sprouting from his chest. It was pretty freaking hilarious, but the muscle soon arrived, having negotiated a free passage for themselves through the room. (Hey that 19 gold is too important to just give away, they are here to find treasure, not lose it.) Then wizards took their revenge, popping each goblin head with a magic missiles until none remained intact. Quinn dashed towards the end of the hall like a mad man and tottered to a sudden halt at the edge of a pit trap concealed by the moldy rug. The surprise battle soon ended, and the party was confronted with their first puzzle, in the form of the chess piece battle. They had to negotiate the chamber by moving as either a knight or bishop, while fighting an opposing team of four pawns, knight, rook, and queen. The challenge was fun as the players learned how to enter the room and join the chess board. There was some confusion over the movement effects of certain powers, and how they related to the chess moves. The principle idea was to move as a piece, but fight as usual, so we decided move effects would work as normal, and I also allowed people to use charge with their chess moves. It was an interesting and fun puzzle-combat. Forgetting the neo-otyugh chamber (oops wrong dungeon) the characters bee-lined directly to the final climactic encounter, which was an exciting battle with the wizard Malareth and his undead companions. The fight was brutal, but quick, and there was lots of healing. The critical moment in the fight happened when the cleric Sola used her last healing to revive Hagen, so he could revive the fallen wizard. Everyone managed to pick themselves off the ground, and Edith the dwarf practically soloed the hulking zombie (described as a huge and bloated fat humanoid, like the zombie in the grocery store in Zombie Land, rather than an ogre. The wizard could immobilize, and had a rechargeable necromantic burst attack that hit everyone in the party at least once, but other than that he was fairly lackluster. The skeletons had an incredibly high armor class for some reason, and really high hit points. I guess they were the “soldier” type, and they boxed the party in at the doorway (as usual for practically every batle of the night) and when the skeletons finally fell, the zombie hulk and the pathetically evil necromancer were soon to follow. Each character found one million gold pieces and retired to a country estate, the end. Overall it was a fun adventure. 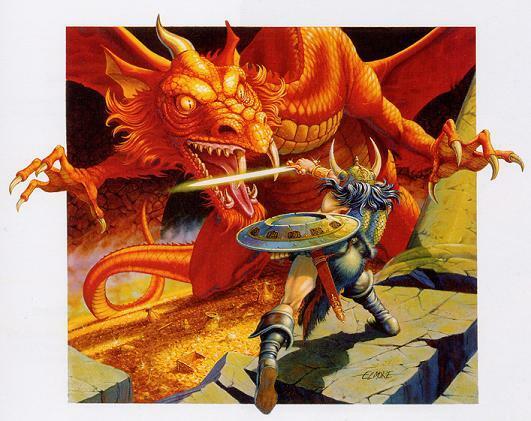 More combat heavy than Pathfinder by default, but not always necessary, as can be seen by the role playing through the dragon scene. 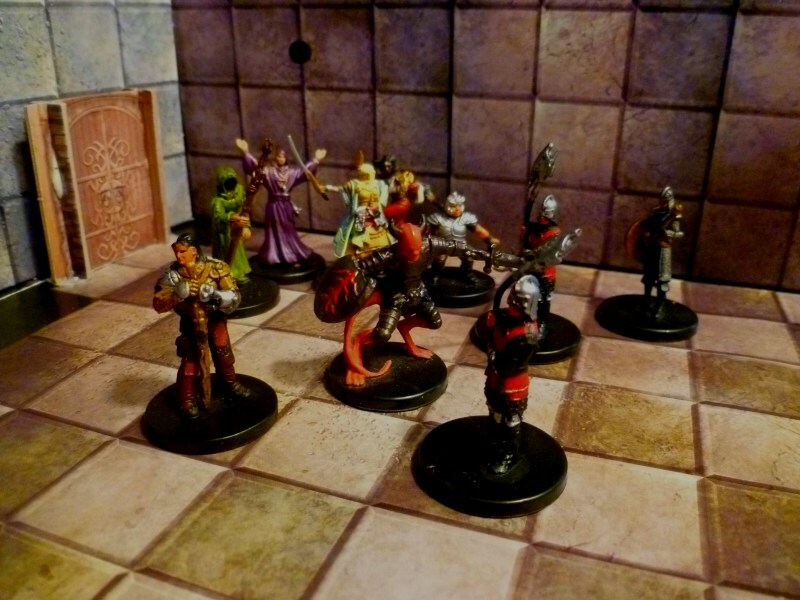 The interesting fact is that each box set approached the same classic “mini dungeon” introductory adventure in almost the exact same way, yet each of them were totally unique in the specifics. After the adventure, we talked a little bit about the differences between the two, and few people were ready to say one same was better or more fun (with the exception of my wife “3e is a saint!”) The consensus was definitely to continue playing 4e if it were ever to come to a vote, and since I am already in the planing stages of the next campaign, my preference is also with 4e. There are just too many options, it is like a drug. Pixie bards, vampires, goliath berzerkers, and satyrs are just a few of the infinitude of character options available in 4e. Oh and it was our last game session of the year, nad it was our little x-mas party to boot. Good food, good friends, good gaming, and to top it all off, I, the humble dm, found some good little gifts to bestow on my players, in thanks for them returning week after week, year after year, to listen to me incoherently babble for hours on end. 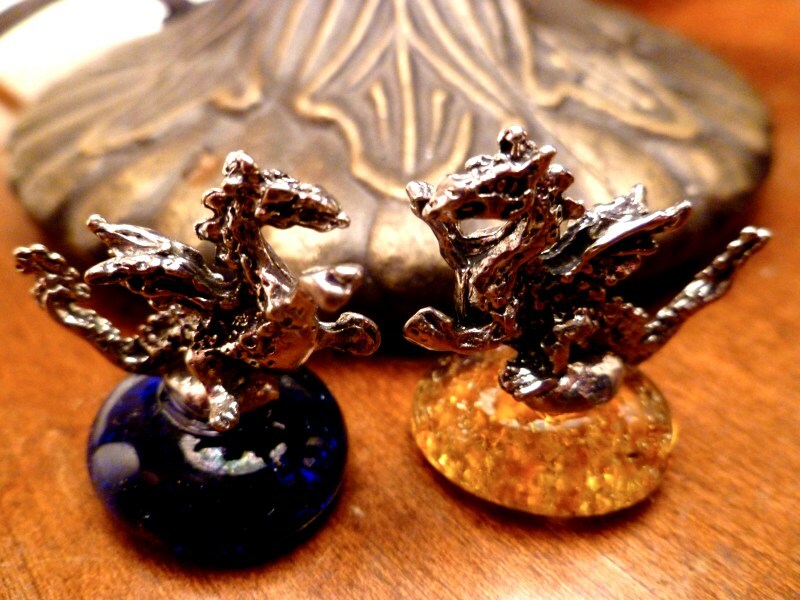 There is no subject I cannot spew forth as though with expertise, and there is every subject that I can be found lacking in said expertise, but my friends and family understand that about me, and apparentyl they are ok with it, so I gave each of them a little dragon momento as an x-mas present. Played at the Basement Games in Zona Rosa, Kansas City MO on Oct 23rd, 2010, I gamma mastered a group of four mutants as they adventured into Trouble in Freesboro. We started by creating characters and that took the first hour of play since I was the only one with even a passing familiarity with the rules as we all tried to understand the sometimes vague or over-brief explanations. The four players were my 11 year old daughter who played in empath felinoid named Gale (then Gail.) My 13 yr old son played the electrified doppelganger Vivaldi. The other two players, one from the area and another from the nearby college town Topeka played an empath plant named Aloe (who spent much of his time in giant form) and a radioactive mind breaker named Cornibulus. Character creation is one of the most fun parts, as it is fast and full of rolling. Starting of with a couple d20 rolls we quickly established the character origins, then moved on to the powers and traits, which I had printed out on a cheat sheet and stapled to the character sheets. I think it helped and allowed people to flip to their origin descriptions and abilities without consulting the manual. With only one manual (to start with) I think it proved helpful. One of the players ended up buying a box set about midway through the 4 hour session, so I feel like I did my job. They also each bought two decks of cards, and I bought four decks – a pair for each of my kids. I am not sure how I feel about the tacked on collectibility and/or buy-in required to play the game, but I planned on hand waving the whole requirement and have everyone draw from my deck throughout the game. As it turned out, it wasnt an issue, and my decks never even got used the whole day! I was bummed,i especially since I fancied them up wth card protectors in my favorite aftermath colors: black and yellow of fallout signs. The other problems with the cards is that the way the rules read, it could be that a character starts with two alpha cards and an omega, or one of each. It is difficult to figure out which one is right. During character creation it sounds like you draw one of each. But then jit says before a session draw one of each later on in the book. Is this the same set or a second set up alpha mutations? It ended up that I allowed them to start with two of each, but I have a feeling that a first level starting character should start with one of each, or possibly two alpha and one omega. More research needed. Rolling for ability scores was fun and ended with LOTS of low abilities, but the ones that mattered were high so it had little impact other than flavor and skills. The skill list was small but I wish the character sheet listed all of them, rather than 4 blank lines, and totaling up skill modifiers was the most difficult aspect of the character creation process. The best part came next: gear. I absolutely love the way they do weapons in Gamma World: broad categories that share stats. Everything is light or heavy, one handed or two handed, melee or ranged, or gun. At some point I would like to see a heavy 2 handed melee gun. Maybe a rifle that shoots out a giant clown fist? Each weapon type keys off STR/CON or DEX/INT which was cool, and even used the same damage dice, so a guy could pick a heavy two handed melee weapon, and call it a dumbbell for instance, and it could just as easily be a ranged heavy two handed weapon with all the same stats. Simple, elegant, awesome. It is great and each character got tl describe their weapon. longbow, electrified mono-filament, tire filled with rocks, land robot arm were the weapons of choice. The armor was a little more simplified, consisting of light, heavy, and shield, and we didnt spend much time on it. Next it was time to roll up the random junk and other gear, and much canoes, riding horses, cell phones and cans of fuel were had. Interestingly no one chose a gun, perhaps scared off by the ammo rules, which are another favorite aspect of the game. A character either has ammo or doesnt. if they use ammo once per encounter they still have ammo at the end, but more than once and might as well let loose, because at the end of the encounter they are out. Also, all ammo is universal. So we started out with the most minimum of back ground role playing. 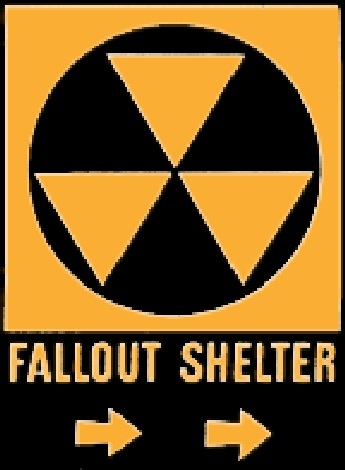 I described them meeting up on the road while traveling near the atomic ruins of Ashville Innasea. They came to the small quaint village of Freesboro, a point of homeliness in a world of post apocalyptic mayhem. There were apple pies cooling in a window as they passed a town house and came to the town square which was bustling with townsfolk. Mayor Thompsoon greeted them in the town square. he was a happy fat man who seemed to hover and bounce a few inches off the ground as he explained the trouble in nearby MedCen park. He mentioned an antique mall the town owned, and offered them a free shopping trip should they succeed in rooting out whatever was stirring up trouble out there. The mutant allies then each got to question a town villager for more information before setting out. I am constantly battling time while game mastering, and I am beginning to accept the fact that I am the main reason for my games never progressing quickly enough, and today was no different. Practically half the play session was spent before we even rolled for initiative, and from this point forward, other than some colorful description I kept the role playing to a minimum in order to get through as much of the “adventure pack” as possible. As it went, we made it through about 2 1/2 out of 5 possible encounters, which broke down into the first, final, and in between a shortened skill challenge type encounter in between. The first encounter was brutal, and part of the reason may have been because it was intended for 5 allies instead of the 4 we had. The party was heading out to MedCen park to find out what was happening, when they came to a group of porkers burrowing into the side of a hill looking for food and treasure. A flock of radioactive red ravens hovered about picking from the remains the pig men scattered. With a grunting challenge, the porkers attack. The battle lasted five rounds, and in the battle Gale failed three death saves, after falling unconscious from a porkers fetid sneeze. The doppelganger faced off single handedly against the radioactive bloodflock and as their glowing beaks pierced his flesh they stuck in him, following him wherever he moved. He was knocked unconscious by the birds but lived. The radioactive mindbreaker was practically immune to the flock and once he scared off the porkers who dared to attack him, he quickly drove off the radioactive ravens. After the fight, each mutant ally was able to make an omega tech deck check, or I should say they each drew a card. They also had to turn one of their alpha cards in and pick a new one. This also happened whenever a one was rolled, for any reason, even when a monster rolled one. By the 3rd battle most of the characters had three of each type to choose from and whenever a 1 was rolled, I had them roll a six sided die to randomly choose which mutation the alpha flux changed. Also, I misread the section on taking from the gamma masters deck on a roll of 1-9, so I can see one instance where my deck would come in handy. It would have meant my yellow and black cards would not get lost in the players hands, had the rule been used, so I am doubly glad for the awesome protectors. Also, and I promise this will be my last complaint about the cards, they should had had different backs. They are never used together, there is no earthly reason why they should have identical backs regardless of whether it is alpha or omega. It simply makes them more difficult to sort without adding any benefit. About this time it was 4 pm. We had started playing around 1 pm, so 3 hours had passed and only had an hour left, so I skipped ahead some – I wanted to have the boss fight with Genghis Tang, so I gave a quick summery of their working the way through the MedCen research building. I skipped the handouts, which seemed pretty useless, although it would have been fun to use the floor plan for some exploration if we had time. It was a lot of fun to improvise the types of things the party came across as they explored, being similar to our world just before the big mistake. I ran a short version of the computer terminal skill challenge type encounter, where everyone had a chance to work on the computer of glean some info from it. They got to see the video feed of giant cockroaches in the basement. Luckily, they were going up. I also described how they found the alpha and omega cards on their way to the final encounter – I wanted the players to have the full arsenal for the final encounter, including the two bonus cards given away to participants. As it happened, no powdered scientists were used, however everyone loved the power mimic, especially for one of the doppelgangers mutations that allowed him to create a whole pack of himself. As far as omega tech goes, it might have been bad luck, but few omega cards were used during the game, and although overcharging was attempted, it usually resulted in a failure. So I flipped the poster map to the excellent research center map, placed the enemies, and we went to town with a crazy final encounter. Genghis was a great villain, and the fact that he wore a NASA space suit (complete with a jet pack) and carried a firemans axe made him unforgettably awesome. Another awesome villain was the dabber who did nothing but sit on the elevated cat walk and shoot his ancient WW2 era carbine the entire fight. I pictured him as some weasel faced sniper. The porkers all charged, the bunny bounded, and it was a big melee on one side of the room. The midbreaker had an omega tech that allowed him to take control of one of the laser batteries. And Gail the felinoid was knocked unconscious, but was thankfully soon healed. We were out of time, so I let each character have one last turn to try and clear the room. Genghis went down, as did the hoop and all the porkers, and when we finished the game, only the dabber and his M1 Garand were left on the board. Over-all it was a great time, and I am in love with the simplicity of design. It was easy to jump into the game, and the combat was quick, over the top, and nail-bitingly exciting. Killing the character of my youngest daughter in the first encounter was not how I hoped to start the game, and for a moment I could see her eyes start to tear up. But just then some one mentioned cats 9 lives, and I rolled with it, and let her to bring in the twin sister of Gale, Gail, and a crisis was diverted. All 4 players, my kids, and the tguys I met and GMed for pronounced the game a blast, and even though we were slowed by my unfamiliarity with the rules and the adventure, it was wildly fun. As I mentioned earlier, one guy bought the set on the spot, and I have a sneaking suspicion the other fellow will be buying a copy, too. The store was very accommodating. I have never seen it so busy in there, but there was a Warhammer tournament going on. They gave me a 10 per cent discount on the gamma cards, card sleeves, and Ravenloft, which I will describe in another post. 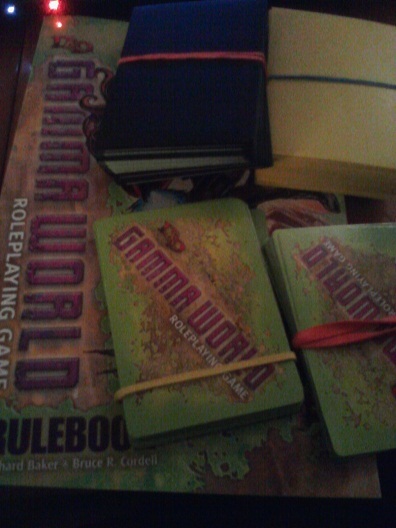 In summary, the gameday was a success, and the Gamma World game is off to success. The adventure Trouble in Freesboro was pretty good, and the poster map included is the best. It will see lots of use in future Gamma World games. One map is a stretch of highway, another is a garage, and both feature plenty of old burned out vehicles. The flip side is a huge research facility complete with strange machinery, laser batteries, an armory and even a restroom (where hilariously one of the porkers began the final encounter, heh.) The second best part are the monsters, new builds of ones featured in the rule book. The two cards, power mimic and powdered scientists seem pretty cool, but there are so many wonky power cards, I am still being surprised by some of them. This game is a lot of fun, and some people say Gamma World is perfect for beer-n-pretzel style “one off” games, but I can see potential for longer term campaign play and look forward to the chance. Another way I plan on squeezing more Gamma World into my life is by including some “transitional” adventures where I cross-pollinate in and out of my regular DnD games. Oh yes, the mutants are out of the box, and they cant be stuffed back in. 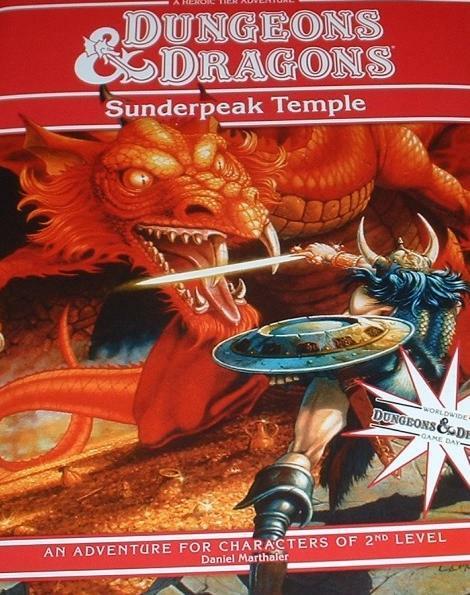 The Red Box Game Day adventure Sunderpeak Temple included lots of important and interesting background material, which I completely missed by being late (as usual). For todays game I would be a player rather than DM, for only the second time this century. (The first time didnt end so well.) Our Dm today was Ron, who is known in some circles as Yuka the bald brawler. This was his first time DMing, and I only had to bite my tongue about 40,000 times, which is really more about me than him. He did a great job, followed the rules, kept the game flowing, and we got through an amazing 4 encounters in our 4 hrs playing. If anything, I would say that he was too easy on us, which is how I spent my first few years as a dm too (believe it or not!) It is hard to really lay a good beat-down on your friends as much as you might secretly want to! And maintaining balance and fairness, always foremost in a DMs mind, is often at odds with the sick powers some of these momnsters have at their disposal. To combat my normal tendency to go easy on players I try to develop an evil side (I know right?) who takes delight and glee in dishing out punishment, but Im wracked with grief and anguish when my monsters die. Another technique I use is to call some one out and tell them straight up, they are gonna try and get you this battle, so gird your loins! For example, in a recent game, the PC playing the princess,had to face the undead ex-princess who had a special desire to scalp her living successor. Or if I am feeling particularly evil I might tell a player something along the lines of Um, Jack, everyone is out to get you in tonights game, just thought Id let you know. I have told my son who plays the barbarian Thokk this before every game since Thokk was about 3rd level. Being tough on the PCs is tough to do, and there is a fine balance. The best way during combat is to look at the tactical situation and announce the intentions behind the monsters behavior. Usually it will come down to who is who is bloodied, or closest to going down, who is most vulnerable, and who is the biggest threat, in that order. This Red Box Game Day is the story of how one lil ol elf, Thia, endeavored to shoot whole bunches of monsters with her short bow for epic amounts of damage. 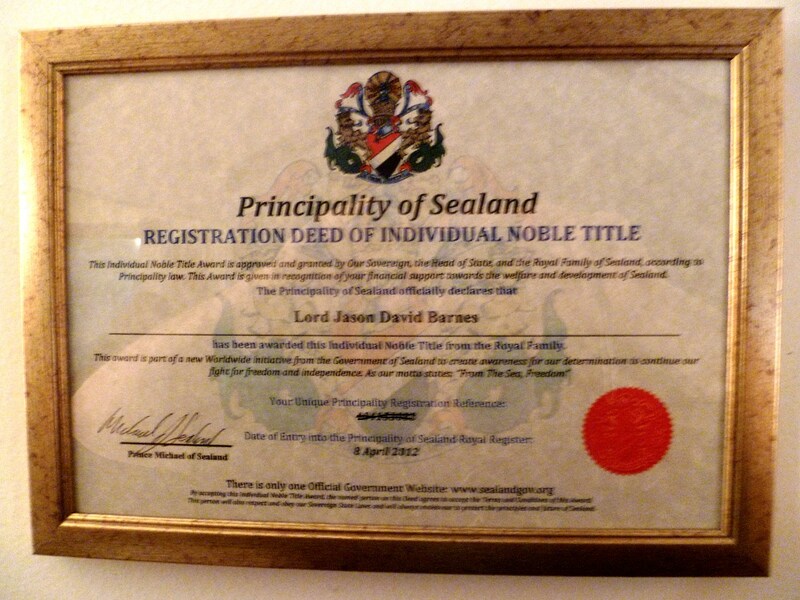 (heroic amounts really, but it felt epic.) In another recent game day, Bennybe the ELADRIN rogue made his debut and grand finale both by causing a total party kill. There was one major difference between the builds, and that is ELVEN ACCURACY which got me out of three natural ones during the game. I didnt miss teleport one bit, especially with Thias agile, sneaky tumbling tricks. I love Thia! So, the party consisted of Thia, and… the rest. Lets see, from backest to frontest, after my thief, was Ander the half pint hobbit with happy feet and a pointy dagger and also my associate rogue. Beside him stood Luca the elfish wizardess with the craziest spells ever. Out in front we had the cleric Corzon Stormbrow Thunderhammer and finally our defender, an Essentials Heroes of the Forgotten Lands dwarf knight and master baconeer. Wearing a suit and cape of thick cut bacon strips, the dwarf carried around a giant slab of dwarvish bacon so rugged and tough it had the same or similar stats as a maul. His main attack was a melee bacon-slap, and his bacon became deadly rancid by the various creatures it came into contact with over the course of this adventure. We were sent out to find or retrieve something, from somewhere, that might include bad guys. I heard: there is much treasure to steal. And in fact, no sooner had I sat down at the table than a potion of healing appeared on the board, so I naturally slapped my hand over it like a high stakes card game. Thia will hold it for whoever needs it, after all her movement would allow her to get to anyone an administer it as a minor. Woot, treasure number 1. It turns out we were storming a ruined stronghold, or temple possibly. The walls were stone, but there was no roof over this section. The enemy was shown to be two orc archers and their reptilian guard drakes. 2 of each. I was first to react and I let fly with a ranged backstabbing first strike sneak attack against the nearest drake. I hoped my 20+ points of damage would fell the scurvy dog, but it didnt even bloody him. I used my sneaks trick to hide in a corner. The halfling Ander charged an orc, which was hilarious because his other character, Kindrock, would use the same opening move. Whether it be lumbering half-giant with mighty axe, or flapping footed hobbit with a pointy dagger, it works. It was awhile until it was my turn again. I was hoping the rest of the party would sweep up after my incredible dog-shooting opening move, but there was more work to be done, so I used my movement trick to climb to the top of the wall and stealth, then I fired at one of the orcs. Soon enough, a bandit appeared, and I shimmied down the wall to attack him with my short sword from stealth. My deadly attack bloodied him. The battle ended soon after, and we discovered no treasure but for a magic well that would increase our healing if we drank from it. I filled my Big Gulp. Soon enough we were moving out towards the back end of the temple. Ander and I had taken over the lead, being fleet of foot, and we spied a kobold on guard duty at the en of the hall. I motioned Ander down the hall whilst I placed a well aimed quarrel into the dirty rats temple. I had hoped to murder him in secret and drag off the body but sadly, the whelp squealed like a struck pig as it went down, alerting the garrison. It was time to rumble, and this time we paired off against a big brute and more orcs and koblods and stuff like that. To sum up, we slew easily. There was no better treasure to be gleaned, even though I picked the pockets of every statue we passed. Whats up with evil temples nowadays, must be the recession. None of them had gems for eyes either, though I did manage to pull one gold filling out of one of my kills. The third battle, in the dungeon beneath, was versus undead, and the wizardess really displayed her awesome powers here. Every turn she rocked the room with some kind of wave of energy that knocked all the enemy 25 feet back! And did a tiny amount of damage. Other times she would fire off her pair of magic missiles. There was also a tough skeleton ion here to fight, but he went down under my barrage of arrows. All the undead spent the whole battle bunched up and pushed against the far door by the wizardess, while the bacon master strode in and used his bacon slap cleave, an I fired at them from cover. They were soon toasted. 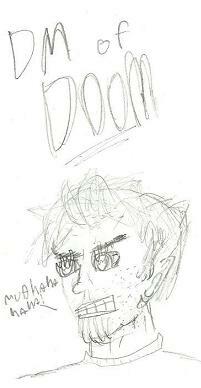 Before today, my last character was a human druid named Shmuckly. He was known for having invented a backpack for transporting potted plants. He would hurl a plant as his opening salvo in an engagement and in this way he was able to cast his main spell, entangle, in almost any environment. It was Shmucklys way of spreading nature, like Jhohnny Appleseed. This character only rose to 5th (or was it 7th… hmmm…) level, and I last played Shmuckly in 1985. I then became the dm for my group of friends and never played a PC again with little regrets. 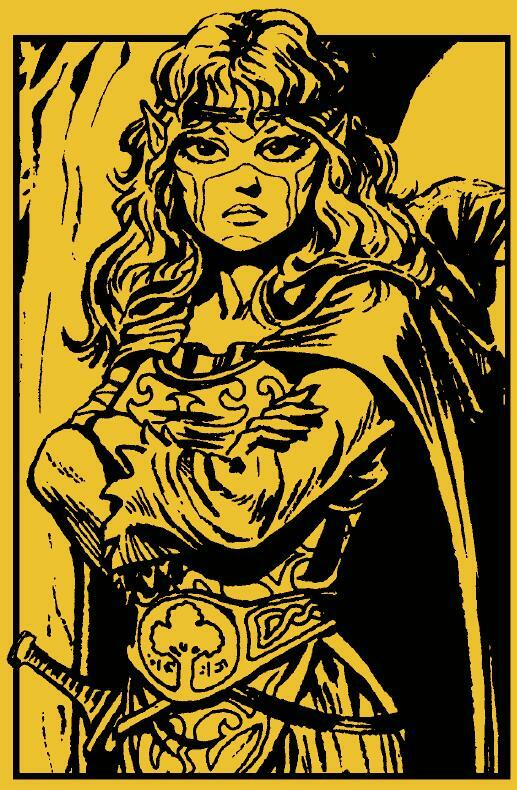 That all changed today, when I took up the reins of the PC once again, and rolled up Bennybe the Eladrin Rogue 4. 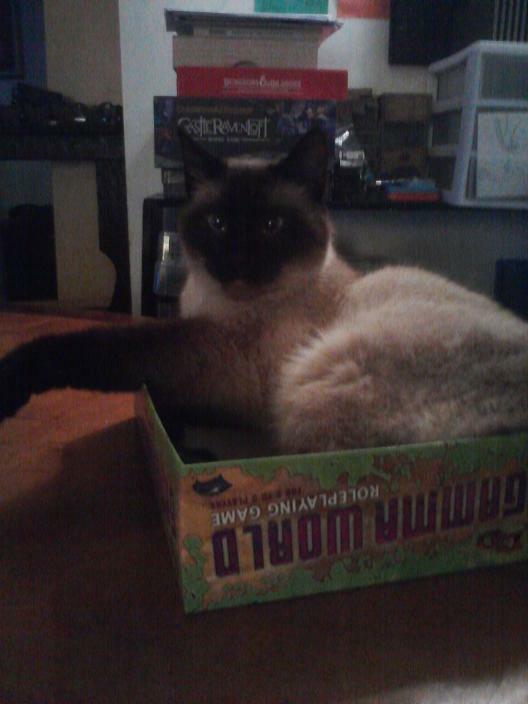 Bennybe was a wastewalker though I forgot to use his encounter power the entire time we played, much to my chagrin. I did use most of my powers though, and while I am mixed as to my final verdict on Bennybe as an effective character, I had a lotta fun. Read on to find out how Bennybe and his friends, the tiefling warlock, the goliath barbarian, the thri kreen seeker, and the half elf bard went in search of the lost cistern of Aravek. I cant remember any of the characters names, so from here on out, they will be known as Ron the warlock, Midget the half giant, Dr Flamulus the Mad Guitarist Bard and my son the seeker who well just call Pakcha why not. I might be called Bennybe, Barnaby, Bugz Bunny or a few others. Well, the plan was to play from noon to 4 pm, and I was late by almost half an hour. Not being the dm had instantly converted me back into my slothful, chronically late and unprepared usual self. Once we got started, we still managed to get through two encounters in our time, so it wasnt too shabby. The adventure began in the usual Dark Sun tradition, a doomed expedition into the Wastelands on a hopeless mission. 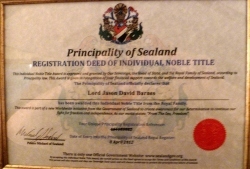 This on involved water, magic wter perhaps, so we knew it was serious busiiness. I reminded everyone to buy survival rations and sunrods. And healing fruit. I wanted a bunch of healing banana fruits. So my first roll of the day was part of a group endurance check, and I rolled a 20! Auspicious beginnings indeed. Some more skill checks happened and might have included zombie cactus, butin the end a few of us lost healing surges and we were attacked by a herd of elves. To me, it was worth failing a skill challenge if it meant we could rid the world of another herd of elves. And so we commenced to do just that. We were surrounded on all sides and attacked by 8 or so of these elves. 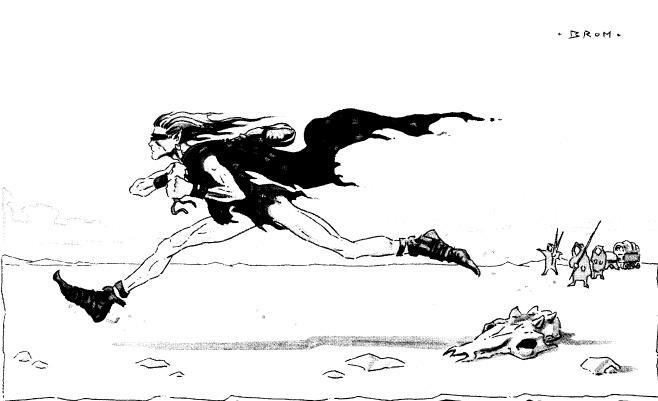 There was a leader who stayed well back, a group of slinging minions, then 4 or so regular old elf dune striders. The battle went ok, and it took a while for us to whittle them down, but in the end we were victorious and no one dropped. Most of us however, were bloodied, especially Bennybe and Midget. It was during this battle that I noticed my rogue was not quite meeting the min-maxed damage output I was expecting. Bennybe was an eladrin, a dagger wielding cunning sneak rogue, multiclassed into assassin for the shrouds. He was +12 to hit with his basic at wills, and with combat advantage (+4) he could put out 1d4 + 2d8 + 1d6 +6, for a minimum of 10 points damage and a max of 32. In addition, I had a minor encounter attack (low cut) which gave me a great opening salvo. My fey strike dagger was my other secret weapon, a dagger that once per encounter would allow me to make a melee basic from 20 squares away and once daily would allow me to teleport the target to any square adjacent. Oh yes. bennybe was hitting on all cylinders. His dex was 20, and everything else was 14 or 10. In his other hand he wielded a long sword, and I often switched between longsword attacks (1d8 but only +10 to hit)) versus the puny dagger d4s. It didnt seem to make a difference, I rolled a 1 for damage either way 😦 Over all, he was a great character to play. I used my ninja mini for him, which might be the first time that mini was ever used as a pc. Ninjas are very out of style now. it is all about pirates, or it looks like actually pirates are on their way out the door, what is next, maybe mental mutant psychic purple giants? One big difference between playing and dming is the delay between my turn, and well, my turn again. This is obvious to all players in DnD, but a dm sometimes forgets the importance of moving the turns along, since in some ways it is always the dms turns. In fact, as a dm I sometimes get annoyed when a monsters initiative comes around, since it takes me away from keeping track of whats going on to actually DO something. Thats not entirely true, as I am i on the edge of my seat, hoping against hope that the monster survives the tide of players turns to even get an attack. So the half hour spans between turns can really add up. Our dm did a good job of keeping the game rolling, so I never felt too distracted, it was fun just to hang out and try to be funny and play the game, regardless of whose turn it is. That pretty much sums up my gaming philosophy right there, though. After the elf battle we moved directly into the battle with the solo, a Tembo, a frightening creature of Dark Sun who uses its hideous strength and deadly prowess in combat in combination with its ability to drain the life out of its enemies. This level 6 solo proved to be one tough cookie and it killed us all, but it was a quite close battle and the outcome was never fore-ordained. I rolled my second natural 20 of the night for initiative, and it meant I would go first. I knew this would be my last battle of the day, as 4 oclock was fast approaching, so I decided to use my three secret weapons: my action point, my daily power, and my daggers daily power. The layout of the battle pitted us on one side of a flowing underground stream of unknown depth and the tembo on the other. I cast my dagger at him, struck, but when I attempted to use the daily teleport power, the tembo stopped it. Arggh! This did not bode well. In the end he came over of his own accord, and that proved to be worse than him staying far away, and besides the water wasnt that deep. I didnt want t waste my minor action to examine the stream at the moment. The battle continued on for many rounds. As we fought over the course of the next few rounds I used my second wind, activated my daily which was a stance that gave me a free attack against anyone who attacked me, and I administered a healing potion to the fallen barbarian. This proved to be a mistake, since the tembo had an aura that reduced all healing by half, as well as doing 5 damage at the start of the barbarians turn. So she was not saved. Oops! Our options looked better when later that round the thri kreen rolled a natural 20 on his death save and made a surprise recovery. It too would prove worthless, as the tembos damage aura had gone from 5 to 10, and no amount of healing could save us by this point. Pakcha fell the instant he rose just like Midget before him. The bard had the greatest daily power ever, which gave us 5 healing hit points back whenever we struck the fell beast, and in the early part of the battle this seemed like it would be the defining cause of our victory, but after the tembo reduced it to 2 hp healing, it was less effective, though still important! FInally it was Ron the warlock and Benneby left standing. The warlock got off one last curse that did massive damage. Impossibly the beast still lived! The dm informed us that it had been minionized (a term I define to mean it was knocked down to 1 hp.) The warlock fell and it was the monsters turn, then mine. I had 1 hp left, it had 1 hp left. Either way, if it attacked or delayed, I would get the first blow, since I had my daily power stance activated. I was sure that victory was mine. The minor inconvenience was that all my allies lay dying about me, thus I had no combat advantage. No matter, he attacked, I retaliated with my immediate interrupt. I rolled a 5. I missed. he didnt. I died, and with me the hope of our entire party, and possibly that village or whoever it was that needed the water. WHo cares, though right, cause I know Bennybe dont. Yeah, so my first character played in 25 years or so bites the dust in his second encounter, taking the whole party down with him. Not quite the ending I had hoped for for the session, but it was still loads of fun. As I said, after many years of watching my minions die at the hands of blood thirsty player characters, to have a single little guy like Bennybe last for as long as hed did was amazing to me. And besides its all about the hanging out, the joking around, the fun and camaraderie. The killing things and taking their stuff is just like a bonus on top of everything else. And sometimes, you get slaughtered mercilessly instead of that sweet desert, thems the ropes, and they make the victories we do see all the sweeter. Special thanks go to Jake, who ran the session that killed me (us.) The battle with the solo was a really complicated battle, but he did it by the book and with skill and tactical awareness. Thinking back over the encounter, I am not sure we could have done much else to win. There were plenty of little things, like the healing fruit mistake, or possibly not activating my stance soon enough – I should have done it in the first round, but waited till round 3. But most of my mistakes came down to being unfamiliar with the character. I think the biggest cause of this, and many TPKs like it, come down to the player not being entirely familiar with their characters. By the time we were 4th level, we all had 2 pages worth of powers to choose between, and many of them have subtle differences that if applied at the right time and place can make game changing differences. And a level 6 solo, 2 levels above the party, was a challenge to begin with. 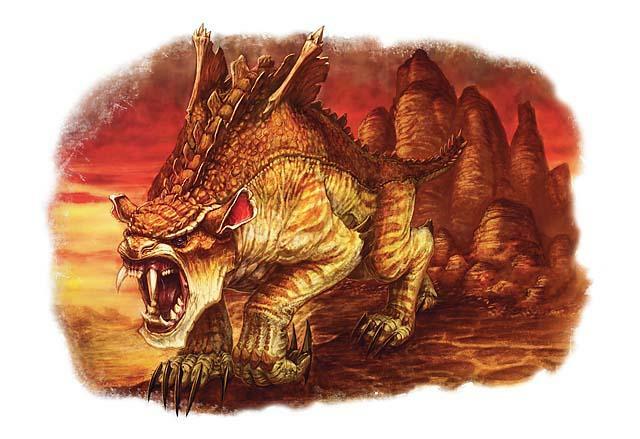 Dark Sun is known for its tough foes, and the game itself has become noticeably tougher with the new Monster Manual 3 design philosophy of monster creation. This involves giving the monster much higher damage output, without increasing the slog by raising its defenses and hit points in the same amounts. This monster was particularly designed to wreak mayhem with healing while fighting it, and its combination of high hit points and low defenses were mitigated by other actions of the thing. Becoming insubstantial was a very frustrating thing to happen, and when you add it all up, it ends up that we players were doing tiny thing for minuscule amounts – our healing nullified, our damage cut in half, if we could even see him to attack, while the tembo tore us up repeatedly, multiple times per turn and multiple turns per round. We became muppet babies fighting godzilla. 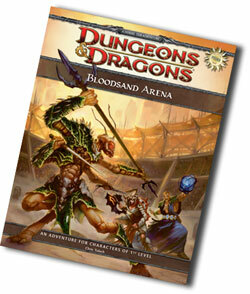 A hands on with the free Dark Sun preview adventure Bloodsand Arena. This past Saturday marked Free RPG Day which I celebrated at the local store I frequent on Wednesday Encounters nights. I had agreed to DM the adventure Bloodsand Arena for the event, and it turned out to be a great time for us, and for the whole store. There were multiple games going on, including a catch up Encounters session 1&2 DM-ed by the owner, and other full tables of games. I believe there might have been a Legend of the Five Rings game and possibly Warhammer among others. We played (most of) the first half of the module in about 3 hours of play time. The players were made up of 4 DnDers from Encounters Wednesday, one of whom was a fellow Dm at one of our multiple tables. This excellent lady is a true hero. New to the game, on the first night of Encounters season 1, when the store was a packed mad-house, she stepped up and took on the mantle of Dm. That takes courage, and her success shows she has awesome dm skills as well. Her son was another player. Then there was a player from my Encounters group, who had just discovered Dnd and this was his 3rd time playing. His 2nd time playing was this past Encounters Week 2, where he was mercilessly targeted due to his arcane nature. The next was a player from the table of the DM who also works at the store and organizes all the Dnd events. Rounding out our party were my wife and 13 yr old son, playing the fighter and battlemind respectively. We also play together with friends on Friday nights, where my wife plays the mysterious fey Poppy the Angry, and my son hacks his way through all obstacles as Thokk the Half-orc barbarian. Due to a freak rainshower, we arrived a little bit late to the store. This has been a season of insane rain. I cannot count the number of times this spring Ive been caught driving in wild torrents of rain. Once I was nearly washed off the road by a hilly side-street turned into raging river. Crazy rain, but enough, we were late, and in a rush to get started, but at the same time damn I wanted to check out the free stuff! Four players waiting, and two with me, there was little time wasted, and even before my bag was all the way unpacked, we had all picked out characters and were getting things started. Even still, as you will read, we didnt get through all of the fist half of the module. Thats ok though, more for later. The game starts with a rather lengthy description of the characters and their backstory. They were long-winded but good, one group of three were on the run from a local crime lord, and the other 3 were desert dwellers come to the city to help their settlement gather much needed supplies. Even before the character description there is a chapters-long overview of the world of Dark Sun. This will be familiar to anyone in the Encounters game, however there were some minor differences. This one left out a few elements from Encounters, but added a few things, such as character themes, arena combat, and an alternate magic item system, based on the rules in the DMG2. The arena combat rules looked especially sweet, with a chance to gain the (dis-) favor of the crowd, which can grant boons. One of the encounters was actually a mini-game, where two teams fought to carry heavy disks across the arena without being knocked into dangerous brambles. All in all I found the introduction to be a great aid to painting an introductory picture of the world. I had previously highlighted the sections of the 8 Things to know about Dark Sun from my Encounters adventure Fury of the Wastewalker, so it was a breeze to introduce the campaign world to the table. The adventure opens with the party hired on as guards for a wily old elf peddler and his caravan of goods. The ceramic good look to be of little value, but they are traveling from Tyr to the outland town of Altaruk, and the PCs seek a change of scenery. A skill challenge takes place, which seeks to introduce the players of Dark Sun to the trials of the desert. I minimized the skill challenge for this event, something I regretted doing, but I simply hadnt had enough time to flesh out the challenge to the point where I feel comfortable running them. Instead I went with a description of their travels, and tried to make it interactive, before asking for a groups skill check. This went on for two group checks, before the third section of the challenge opened with a combat encounter prior to the check. If I had more time to prepare, I would have described the environment and given them each a chance to choose a skill as a way to successfully navigate the environment. I like to have descriptions prepared, or at least visualized prior to jumping into a challenge. My lack of preparedness meant the day would be mostly made up of combat, but I did try to spice it up just a bit with some minor role-play. Weirdly, the adventure didnt contain a map for this introductory encounter, but I happened to have a new set of Deserts of Athas dungeon tiles (imagine that, product tie-in) so we were good to go cuz it gave me a chance to use them. I created a desert area with a sort of shaded grotto created by 3 or 4 large rocks. They were off from the caravan, catching some rest, when they are ambushed by 10 slave clubmen and their 3 slave-master raiders. I had them encircle the party and attack in three groups. One group went over the largest rock, while another came from the north, and the third from the south. The attack was quick and brutal. Dark Sun has upped the danger meter from previous games, and these slavers are no exception. The slave minions have two things that set them apart. The first and most important is the fact that they will remain standing until the end of their next turn after being slain. Total carnage. And the second trait of these human slaves is the +1 to damage for each adjacent ally. The slaves attacked in waves of 3 or 4, led by a raider. They would mob some one and even though most of them were killed on the first round of combat, they did grave amounts of damage to those they mobbed. These slaves swarmed the barbarian, the battlemind, and the fighter. They were minor compared to the hideous double attack of the raiders. 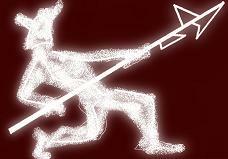 They wielded cruel barbed spears and daggers. Interestingly, barbed spear did no damage on a hit but merely grabbed an opponent, and set them up to be gut-stabbed with the dagger. This was a powerful attack, and at least three PCs were knocked below their bloody value, and the fact that it did ongoing damage meant that unconsciousness was a possibility for each one hit. This combination led to a two round period when the press-gang looked like they had the edge and were starting to overcome the party. By round 3, many minions were felled and finally fallen, so the battle hung in the balance. 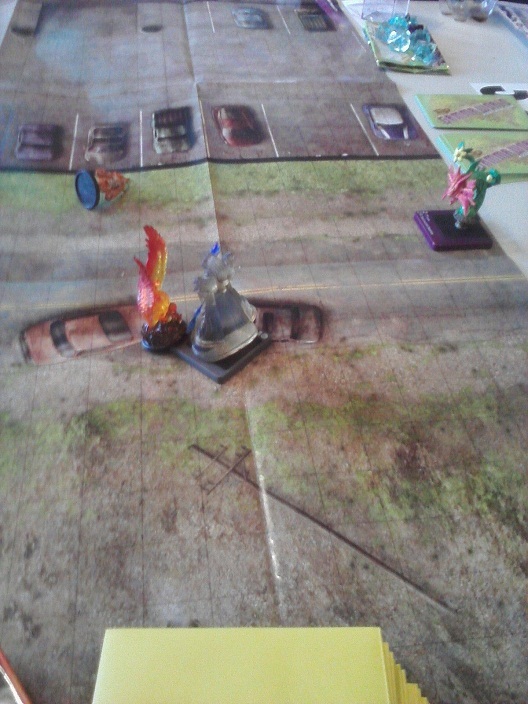 Two of the PCs were knocked unconscious, but the shaman saved them both, as well as himself in the melee. The heroes prevailed. After the combat, the PCs used their healing surges, and had little to loot but what the raiders carried. They then rolled their final group skill check and arrived at the town that evening. Therefore the second combat took place without an extended rest. -At this point, it was 3 45, and we had to wrap up no later then 4 30. I decided to just play this battle out to its bitte end, rather than to mess with opening up that gorgeous arena map for the arena games. It was unfortunate, but I will find a way to use it. Often. Entire adventures are centering around those three eminently useful maps – a market place, the arena, and the slave pens, possibly under the arena. My first dark sun adventure just got planned out simply typing that last sentence, thats what Im talkin bout. So, back to the story. Lots of fighting took place around that tent, and again the fighter was reduced to zero, to be raised by the shaman. 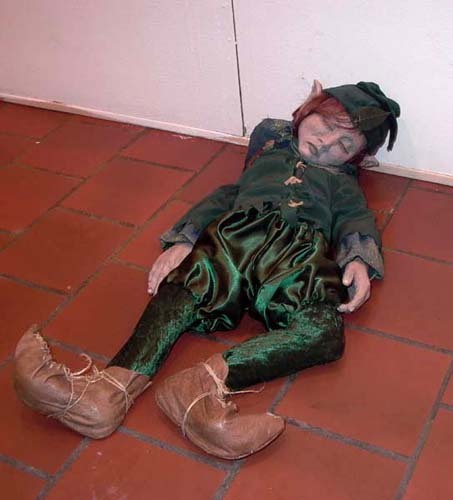 Good usage of action points and some teamwork carried the day for the party, and as a reward they were granted the caravan of the old elf peddler as fair loot by the town guard Tellemon. It was a fun experience over-all, and I think with more time to prepare, the skill challenge could have made for a great evocative crossing of the desert. I knew going in that I would try and do some brief rp and skill usage, but that combat was going to be the focus, and with that mind-set I sort of improv-ed through the rest while skimming it as I jabbered on about Athas. The encounters themselves were also very evocative of Dark Sun, they felt different, harsher. The slaver press-gang, and the family of elf outlaws, also slave-traders it turns out, make for a good sneak peek at the up-coming Dark Sun Campaign Setting. Converting D&D Encounters adventure Halaster’s Lost Apprentice to D’ Erte Ruins of Forge Helm mega-dungeon with kids. This is an unusual combination of circumstance. I used the D&D Encounters adventure Halaster’s Lost Apprentice as the basis for an encounter-a-week game I wanted to play with my two youngest children. I changed the back-drop to occur in my campaign world, D’ Erte, rather than Forgotten Realms; I replaced Waterdeep with the frontier towns of Magmaburg and Minotaur Halls; I replaced Undermountain with the Ruins of Forge Helm, a mega-dungeon I am creating for D’ Erte, but I left the rest of it as close to the original as possible. [No Spoliers here] Halaster was an Eladrin arch-wizard who lived amongst the dwarves of majestic Forge Helm before its fall into ruin, and Fayne and Zereas were his estranged children, each seeking to reclaim what they can of their father’s fortunes. But the characters knew none of this in the beginning. They are a brother-sister team of 2 drow who have recently left their homelands in the Underdark in order to seek the surface world. The brother is a telekinetic psion, and he is played by Jackson, my 13 year old son, and experienced D&D player, eager to try out the psionic classes of the PHB3. My daughter Audrey, soon to be 11, played a storm-sorceress, who worships the goddess of the Sea Melora. I explained that in Drow culture, the female is normally in charge, and so the two agreed that the Sorceress would take the lead. She picked neutral for her alignment, after learning about Drow culture, because she wanted “to keep all her options open.” Thus it was decided that the 2 drow left their homeland to look upon the sea, and to experience the summer storms of Melora. Their adventures brought them first to the Minotaur Halls, a busy way-station between the Underdark and the surface. This fortified pioneer town also lies across the great trade route through the Dawnforge Mountains. From Minotaur Halls, one can choose the over-land route or the under-mountain route to cross The subterranean route also passes through the Ruined Halls of Forge Helm, though the access is barred by a contingent of deep deurger who in the past 5 years have built a stronghold to seal off access to their hated brother’s ancient halls, so access through Minotaur Halls is blocked for most. This makes Magmaburg a much better route into Forge helm, as there are 4 major entrances, and new entrances are sometimes found. Upon arrival, the party detected a buzz in the air, getting their first clues that something was up in Forge Helm. They decided they wanted to investigate, and found a Scout and Guide Hall, run by a surly dwarf named Garson Petty. He introduced them to his newest hire, a taciturn dwarven rune-priestess named Shorty. For 50 gp, Garson agreed to send Shorty on with them to act as guide and guard, with the promise of a fair share of any future treasure they might find whilst adventuring. With the arrangements made, the party set off on the under-mountain route to Magmaburg. Along the way they met up with a troupe of dwarvish miners who told them of the rumours surrounding a newly discovered vault in Forge Helm. It led apparently tothe chambers of one of Halaster’s many apprentices. Arriving in Magmaburg, they questioned some of the locals about the rumours they had heard, and were directed to the tavern, Scabfoot’s Eatery and Drinkery, where they overheard an Eladrin noblewoman discussing a job opportunity with an obvious thug. The party watched silently as she followed them out the back door, and rushed out upon hearing her scream for help. And so at long last initiative was rolled. The thugs, a dwarf strong-man, a Halfling slinger, and a tiefling hedge wizard were waiting for the party across a 20 ft deep sewer chasm, a strange fixture in a pioneer town constructed almost entirely of wood, but there you have it. There was a small wooden bridge crossing the sewer and onto it Shorty rushed, charging the dwarf. She was soon knocked prone and fell off the bridge thanks to the dwarf. Then the psion went, and with an excellent perception roll he found the Halfling, and sent a mental attack his way which resulted in the Halfling falling into the sewer. He was slain by the fall, never having taken a single action. The sorceress sent a lightning attack at the tiefling and the dwarf, then the tiefling struck back, immolating her with his hedge fire. The battle continued for another round, and on the 3rd, the dwarf was killed by the psion, his corpse also being pulled into the sewer. The sorceress, taking the brunt of the hedge wizard’s attacks, was knocked unconscious and burning, but Shorty the dwarf soon made it out of the sewer and was able to heal her. She stood up and sent a storm of energy that finally managed to slay the tiefling, and as the character did what characters do, that is, loot the corpses, Fayne woke up and with surprise said she knows when she has found the right party for her job. She invited them back into the pub to discuss the terms of their employment, and the session ended. In case you were wondering, the ruby-eyed monkey in the accompanying photo is the sorceress’ familiar. 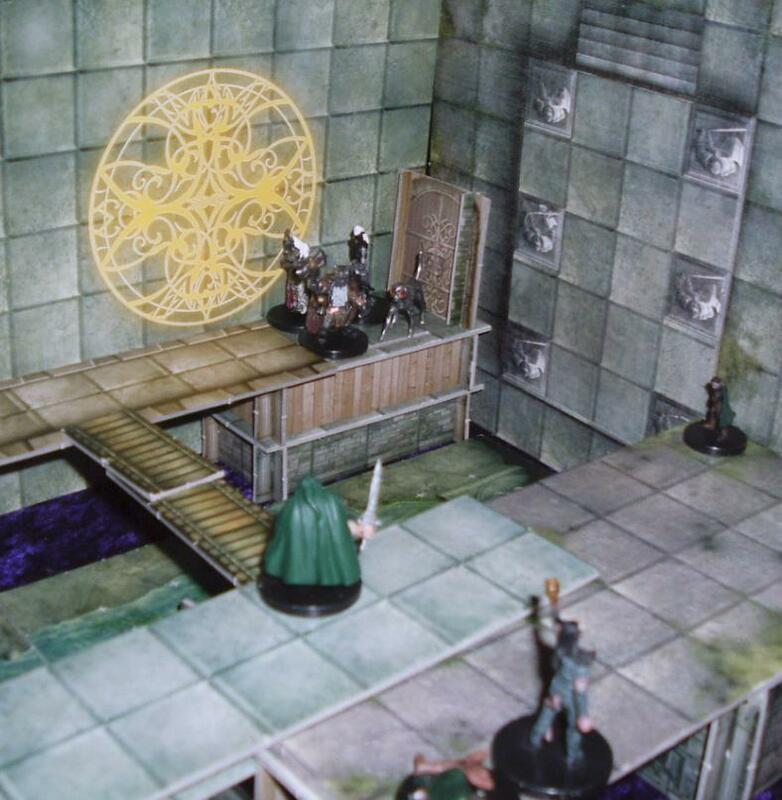 The stage was built with the newest 3d Dungeon Tiles, Harrowing Halls, which have added great depth (and height) to my encounters.